Legislation was passed on Tuesday that officially renamed the East Indian state of Orissa as Odisha and the language spoken in the state as Odia from Oriya, Anglicised names assigned by the British. The latest in a series of official name changes after independence, which also include Kanpur (formerly Cawnpore), Thiruvananthapuram (Trivandrum), Mumbai (Bombay), Chennai (Madras), Kolkata (Calcutta), Pune (Poona), Kochi (Cochin) and North-East Frontier Agency (NEFA) to Arunachal Pradesh. 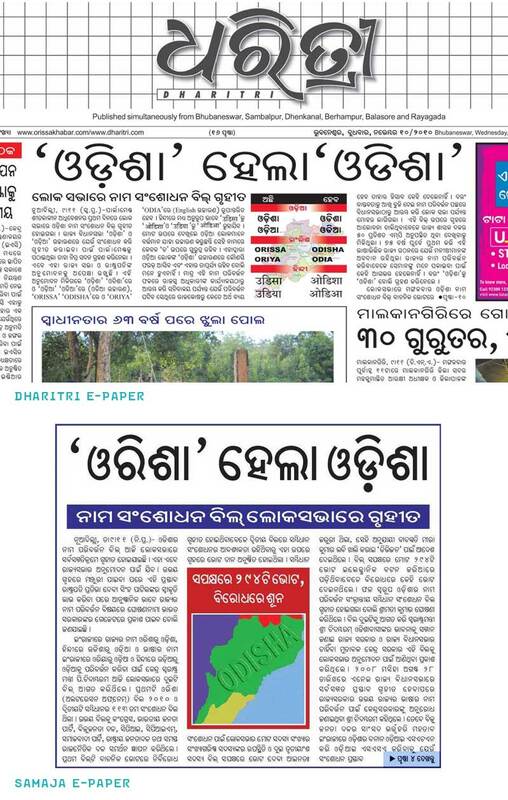 Above, two Odia newspapers write about the change. The Samaja e-paper, and Dharitri. Typeset in very common monolinear fonts.